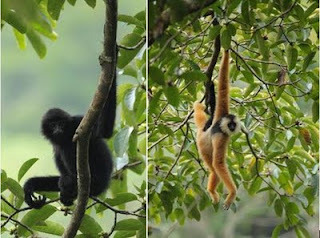 Two new protected areas were designated in China and Vietnam recently to protect two of the world’s most endangered primates by Fauna and Flora International (FFI). The Tonkin snub nosed monkey (Rhinopithecus avunculus), found only in Vietnam, numbers about only 200 individuals in the wild while the eastern black crested gibbon or cao vit gibbon (Nomascus nasutus), second most endangered primate in the world, numbers only just 110 individuals. Both species are listed as “critically endangered” in the International Union for Conservation of Nature (IUCN) Red List. The Tonkin snub nosed monkeys were thought to be extinct until a small population was rediscovered in the early 1980s.